It’s been nice being back in the Pacific Northwest and getting fully involved with all the 12th Man fun as rabid fans of the Seattle Seahawks. When we were living Pennsylvania, I’m not sure why we weren’t rabid fans of Philly or Pittsburgh or even Maryland, since we were pretty much in a triangular area where we could have chosen any of those for our team spirit fandom. Maybe it’s because I’ve always been a Seahawks girl at heart, because my roots were always firmly planted here after being born an raised here, no matter how long I was away from ‘home’. It’s good to be back. Thankfully the entire family has embraced the rabid fan mode in support of the Seahawks, participating in ‘Blue Friday’ each Friday before the weekend game. 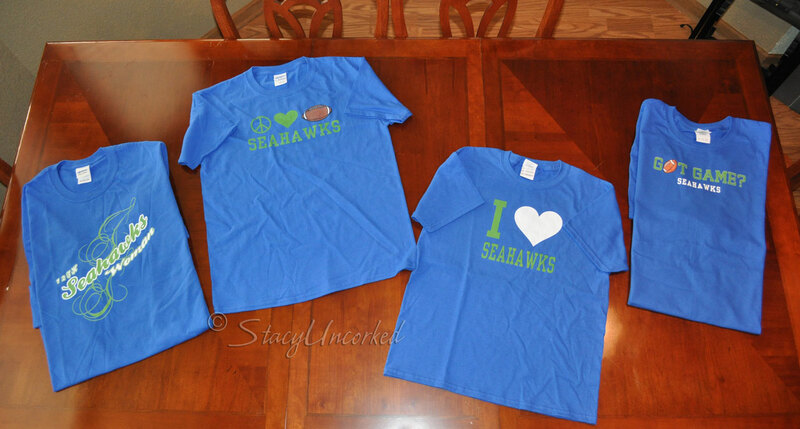 We love our Seahawks, so when I had a chance to create my own custom apparel with custom t-shirts from MyLocker.net, you can probably guess which direction I went in. Ahem. MyLocker.net allows customers to design their own shirts, hoodies, golf polos, fleece, warm-up suits, bags, blankets, or almost any type of custom item in a quick, fun and easy way. The next time you want to customize anything – including your team spirit – MyLocker.net is the place to go. Celebrating a bachelorette party and want to look the part when you’re out on the town? MyLocker can have matching shirts at your door for the entire bridal party. I bet my sister-in-law’s friend who made our custom shirts for her bachelorette party would have appreciated MyLocker and saved herself hours of painstaking work! Have a reunion coming up or want to keep your gang visible to each other in a crowded area? Custom t-shirts would be the perfect solution! Custom apparel is perfect for pretty much any special occasion, and there are no orders too small (or too big, for that matter). Many customizing companies require a minimum bulk order, but not MyLocker.net! You can design one or 1000, your choice! After I made the selections and picked the sizes (which are really easy to do), checked out and then waited. The shirts arrived fairly quickly and were better quality than I expected. Those look like they’ve been washed a bazillion times and faded, right out of the shipping baggie. I don’t know if it’s a glitch in their system, since I did make sure I selected the darkest blue (Royal Blue), but got a lighter blue instead. Even the green is much lighter than what appears on their website. But we still like the shirts anyway, and come this Blue Friday, we’ll all be wearing them! Now that the weather is getting colder, I think I’m going to have to go back in and make some fleece or sweatshirt versions. I’ll let you know how those turn out! 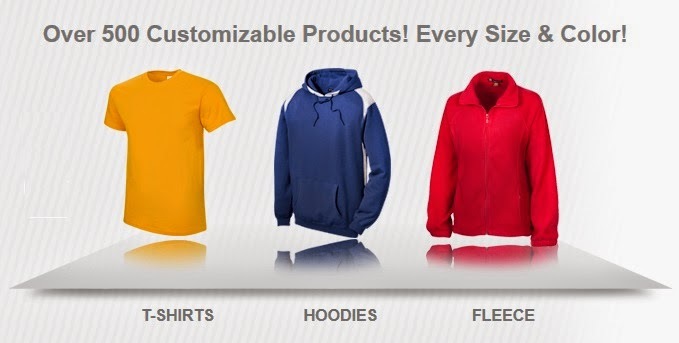 MyLocker makes it possible to order your own custom apparel and custom accessories quickly and easily. They even ship product in as little as 48 hours, so if you happen to be a last-minute planner or procrastinator like me, no problem! To find out more about personalizing your team spirit – or anything else for that matter – or make your own t-shirt, visit MyLocker.net and feel free to connect with them on Facebook and Twitter. Have you ever made any custom apparel for you or your family? This entry was posted in Alert, Announcement, Review and tagged #GoHawks, Alert, Announcement, Custom Apparel, Custom T-Shirts, family members, Fun, Make Your Own T-Shirt, MyLocker.net, pacific northwest, Review by StacyUncorked. Bookmark the permalink. Will Enterprises is a family owned and operated promotional products business, specializing in silk-screening and embroidery. For over 21 years we have maintained the lowest prices, top-notch service and superior quality as our main objectives. We have worked with numerous businesses, organizations and non-profit groups at local and national levels. We employ 100 people and produce our products out of our 80,000 sq. ft. facility. We can produce over 40,000 shirts a day. We produce shirts for such clients as MS, Special Olympics, the Arthritis Foundation, Kohl’s Department Stores and Miller Brewing to name a few. We are a National vendor for American Cancer and have been producing shirts for them for over ten years. Will Enterprises is known for their low prices and quality we provide. Our pricing is one of the lowest in the industry. Please feel free to email me for a quote. Making sure the customer gets what they want is our priority. We have your input and approval on every step of the order process to ensure we produce the shirt or promotional item exactly the way you want it. We are also known for our fast turn-around time. On the average, most orders are turned around within 5 to 7 business days. When needed, we can provide rush service of 1 to 3 business days. If you’re in a bind, Will Enterprises can help!! Our Art Department is staffed with experienced computer graphic artists. Artwork is done at no cost to you provided artwork is supplied to us in the required format(s). Custom T-Shirts – Design Your Own T-Shirts Online ! 28 years, 50+ million custom t-shirts, 99% happy customers! Will Enterprises, inc is the t-shirt printing expert for your team, school, company, or any occasion.